Of course, Croatia has been on my radar for a while now. Dubrovnik, Split, Hvar and and Zagreb are pretty well-visited tourist spots now... but Pula? I'd not even heard of it! Located on the tip of the Istrian peninsula in Northern Croatia, Pula is on the coast and is packed full of the good stuff - culture, views and good food. There are direct, affordable flights from Gatwick making it super easy to get to if, like me, you like on the south coast. And we honestly had the best week! Not only was the company excellent - it was the first group holiday I've been on where I didn't know the majority of people going - but everything about Pula was spot on. Here's why you should visit Pula, sharpish! Pula is home to a Roman Arena or Amphitheatre - in fact, it's one of the six largest surviving Roman arenas in the world. Adult admission costs 50 kuna or around £6, and is well worth a mooch round! Being on the coast you get the best of Mediterranean-style cuisine here; I had some of the most delicious, fresh seafood whilst in Pula. It was often served with garlicky chard and potatoes - simple but oh-so-delicious. Fresh pasta is the order of the day, though, with the pljukanci variety topping my list. Yes, they look like tiny fingers, but they taste like heaven! Gnocchi is also on most menus, with wild asparagus and local cured meats. As if that wasn't enough to whet your appetite, Istria is known for truffles... and boy are they good. Cooked simply with pasta, olive oil and fresh herbs - you wont go hungry, lets put it that way. Pula overlooks the Adriatic sea, offering some of the clearest waters I've seen in Europe. One afternoon we hired kayaks in Premantura and paddled out to various islands, enjoying the incredible views, sunshine and blissful peace. 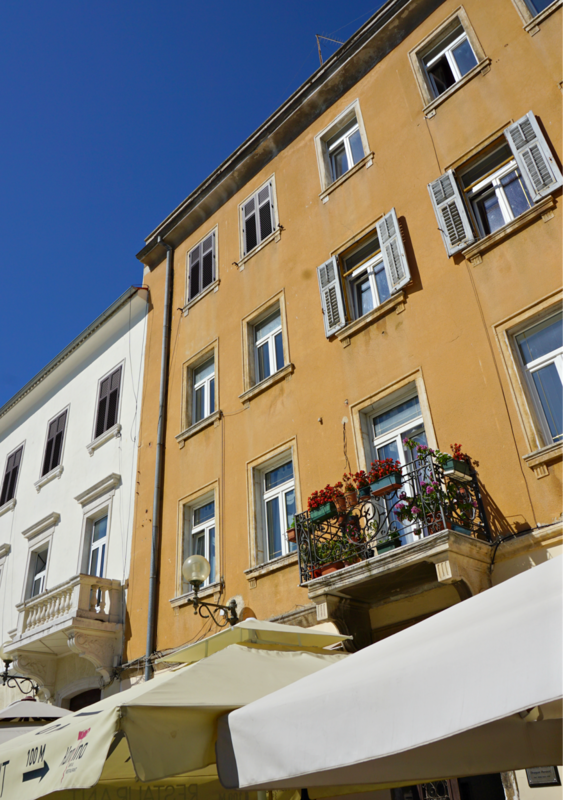 Pula itself is full of gorgeous, old facades - the phrase 'perfectly imperfect' is so apt. 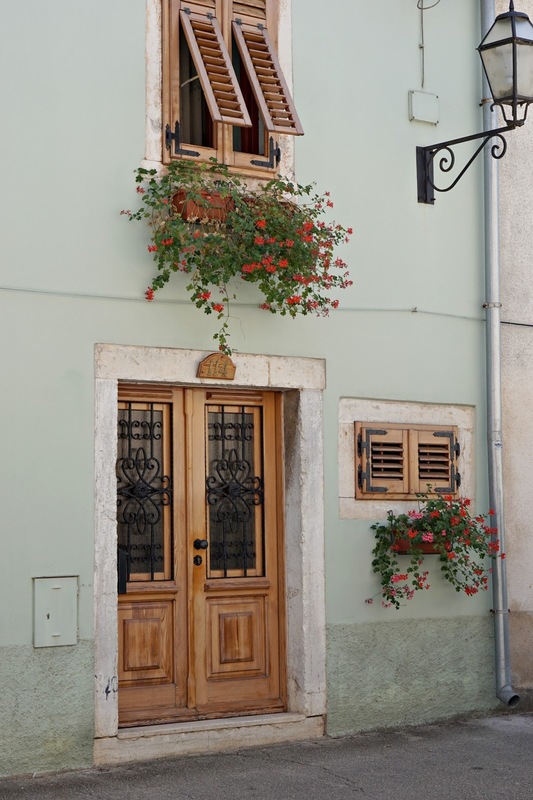 The peeling walls and dilapidated shutters are oh-so picture perfect. Your Instagram feed can thank me later! Head out of Pula and you will be met with some of the most gorgeous scenery in Europe. We stayed approx 20km north east of Pula in Glavani in the most perfect villa and pool set up on the outskirts of a quiet town. The scenery is something else - be it views of rolling hills or crystal clear seas... it's perfection. Ah, the quest for that secret hidden gem! Pula may be a tourist hub, but travel a little outside of the city and you'll find very few tourists. The town where we stayed was home to the friendliest of locals and restaurants where few spoke English - it felt like we were in real Croatia. Totally off the beaten track. Yeh, even with the crap exchange rate at the moment. You could get a big old beer for under £2 in most restaurants, and a huge bowl of homemade pasta with truffles can be as cheap as £3. Dreamy. Pula has an international airport, meaning you can fly quickly and easily to other parts of the country as well as further afield. Not only this, but Venice is accessible by boat or road - taking around three hours either way. Other Croatian treasures like Plitvice Lakes and the island of Cres are nearby also. Don't you just love it when you find somewhere that is so unexpectedly perfect?